Joseph W. Jacobsmeier, 75, of Dubuque, Ia. passed away peacefully at 8:00 a.m. Monday, March 18, 2019, at home with his loving family by his side. To honor Joe's life, visitation will be held from 3:00 p.m. to 7:00 p.m. Friday, March 22, 2019 at Leonard Funeral Home & Crematory, 2595 Rockdale Rd., Funeral Services will be 10:30 a.m. Saturday at the Church of the Nativity, 1225 Alta Vista St., Dubuque, IA with visitation from 9:30 a.m. until service time at the church. Burial will be held at Linwood Cemetery, 2735 Windsor Ave, Dubuque, IA. Joe was born on July 12, 1943, in Amboy, Ill, the son of Greg and Mary (Erdman) Jacobsmeier. He grew up in Dyersville, IA and attended Dyersville Xavier Schools. On August 28, 1965 Joe married the love of his life, Donna Brooks, at St. Mary’s Catholic Church in Dubuque, IA. They had 53 wonderful years together. He worked at Ray's Amoco as a mechanic for 30 yrs. as well as Big A Auto and Thermo-King until retirement in 2003. 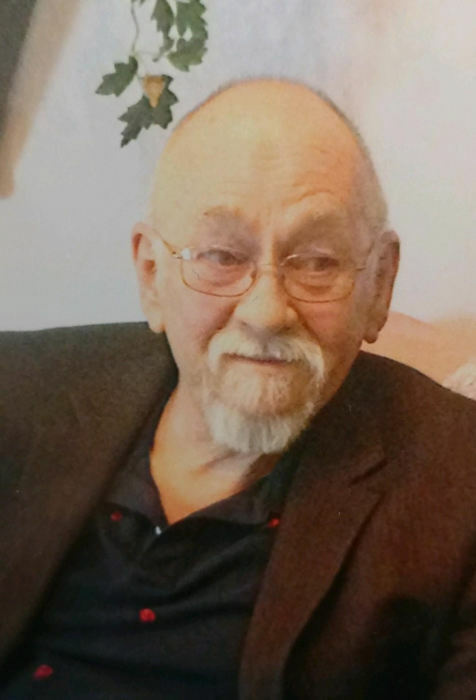 He had a passion for Dubuque History and belonged to the Dubuque postcard club as well as the Panera Bread Breakfast Club where he enjoyed his daily coffee with friends. He also enjoyed his time at home with his beloved dog Bindy. Joe loved watching Nascar and was a fan of #4 Kevin Harvick. He was a Chevy man and very much enjoyed watching Toyota getting beat. Sometimes he would wager a cup of coffee on the race with friends! In his earlier years he enjoyed hunting, camping and fishing with family and friends. He and his wife Donna were instrumental in fundraising efforts for the Veterans memorial Plaza located on Chaplain Schmitt Island. Survivors include his wife Donna; son Ron (Sue Rudiger) Jacobsmeier, Daughter Dawn (Mark) Knockel; 5 grandchildren, Alyssa (Andrew) Schmidt, Emily (Christian) Jacobs, Linzy Knockel, Natalie Jacobsmeier & Amanda Knockel; 5 Great grandchildren, Hayden Jacobsmeier, Parker Schmidt, Remington Jacobs, Riley Schmidt & Eli Jacobs. Sister Agnes Nadermann, Dubuque; Brother John (Judy) Jacobsmeier, Cedar Falls; Sister Bernice Williamson, Dubuque & sister-in-law Janice Jacobsmeier, Monticello; Aunts, Uncles, Nieces & Nephews. Joe was preceded in death by his parents Greg and Mary (Erdman) Jacobsmeier and brother Bernard Jacobsmeier. The family would like to extend a heartfelt thank you to Hospice of Dubuque, Dr. Rom, Dr. Ward, Dr. Whalen, Dr. Kelly and assistant Jennifer, Dr. Powers, Dr. Putz and assistant Barb, and the 5th floor staff of the ICU for the extended care and kindness they gave to Joe.